Apartment can accommodate 5 guests. Beds are situated in 3 sleeping rooms, within 62m2. Guests can enjoy a sea view from the private terrace. Food can be prepared using barbecue which is shared with other guests too. This accommodation unit welcomes pets at no additional costs. House 135 in the town of Lumbarda, Korčula - South Dalmatia contains accommodation units of type Apartment (2) and is 10 m away from the sea. The nearest beach to this accommodation is a rocks beach. The house is categorized as "Facilities near a beach". 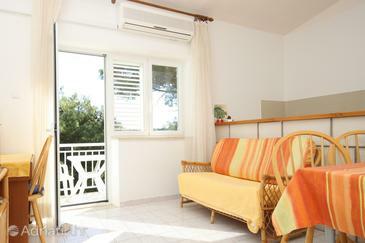 Other guests will most likely be present in the house during your holiday, as it contains several apartments. The hosts reside in the house. We are delighted with this apartment.! The waterfront location, the magnificent view from the living room / from the balcony over the bay, the short walk to the swimming area, the bright apartment in cheerful colors, the equipment and to the charming and friendly owner: it just all fit. Here, the weather has not even completely played. And, of course, is the Rock "beach" with a small stone staircase no no beach for a family with small children. Wir sind begeistert von dieser FeWo.! Die Lage direkt am Wasser, der herrliche Blick aus dem Wohnzimmer/vom Balkon über die Bucht, der kurze Weg zur Badestelle, die helle Wohnung in fröhlichen Farben, die Ausstattung und dazu die charmante und herzliche Eigentümerin: es halt alles gepasst. Dabei hat das Wetter noch nicht einmal ganz mitgespielt. Und natürlich ist ein Fels"strand" mit kleiner Steintreppe kein kein Strand für eine Familie mit kleinen Kindern. Very nice, helpful owners. Not too far from the center of Lumbarda. So if you want to enjoy in addition to the summer programs is the silence, both of them can do so. Nagyon kedves, segítőkész tulajdonos. Nem túl messze Lumbarda központjától. Így amennyiben a nyári programok mellett a csendet is szeretné élvezni, mind a kettőt megteheti. Beautiful and furnished apartment. Nice lady - owner. Lep in urejen apartma. Prijazna gospa - lastnica. Rocky beach at about noon in the shade. Lumbarda: not much going on, but beautifully. Landlord and neighbors (duplex) is very nice. Accommodation very nice - but it should point to the terrace mosquito doors are installed. Very warm, little wind, possibly mosquitoes. A nice relaxing stay - Korcula town is great, about 6 km away. Felsstrand ab ca. Mittag im Schatten. Lumbarda: nicht viel los, aber schön gelegen. Vermieterin und Nachbarn (Doppelhaus) sehr nett. Unterkunft sehr schön - es sollten aber zur Terasse hin Moskitotüren eingebaut werden. Sehr warm, wenig Wind, evtl. Stechmücken . Ein schöner erholsamer Aufenthalt - Korcula Stadt ist super, ca. 6 Km entfernt. My family and I are really nice to spend on Korcula. For the host and the accommodation we have only words of praise. Plaza requires a bit of gymnastics - the reason is the rocky coast that can not be changed but it is not a minus, moreover, such a natural environment only has a higher value. All in all, Korcula island is really interesting. Moja obitelj i ja smo se zaista lijepo proveli na Korculi. Za domacina i smjestaj imamo samo rijeci pohvale. Plaza zahtijeva malo gimnastike - razlog je kamenita obala koja se ne smije mijenjati ali to nije nikakav minus, stovise, takav prirodni ambijent ima samo vecu vrijednost. Sve u svemu, Korcula je uistinu zanimljiv otok. Thanks for the hospitality that has been very kind to Mrs. and very nice. Very beautiful and functional home that is in a great location with very clean in the sea a few steps away. We therefore advise everyone to book a stay at the home of Mrs.
Grazie per l'ospitalità alla Sig.ra che è stata gentilissima e simpaticissima. Molto bella e funzionale la casa che è in un'ottima posizione con il mare molto pulito a qualche gradino di distanza. Consigliamo quindi a tutti di prenotare un soggiorno nella casa della Sig.ra. Beautiful place to relax, calm, clear water. Domestic very pleasant. Only the access to water is not very comfortable. Nádherné místo pro odpočinek -klid, čistá voda. Domácí velice příjemná. Jen ten přístup do vody není moc pohodlný.